Cuz We Said So | That's why. I live in Fort Worth, and there’s a particularly ugly primary challenge on the Republican side, between long-time State Representative (for district 99) Charlie Geren and up-and-comer Bo French. I was introduced to Mr. French when he came to my door and immediately made my day by leading with how extremely liberal Charlie Geren is. I politely listened, and took his flier, thanked him, and went about my day. I didn’t disabuse him of the notion that I’m probably a conservative Republican, what with me living in an old, mostly white, relatively affluent neighborhood of Cowtown. I don’t know if Bo put an extra star next to my name, or if he is just going nuts with the marketing, but as the primary approaches, we’ve been getting a truly obscene number of flyers: I think 4 in one day was the record. Every single one of them is doubly offensive to me: that he’s tarring his opponent mercilessly, and that the things he tarring him with are things I believe in (mostly). The sheer audacity of this postcard made me want to yell. I’m not going to be satisfied until I deconstruct this stupidity. First of all, the image on the front is designed to elicit an instant, gut-level response. It’s a fetus. That means this is about abortion. (It’s not.) The used of the red faux-stamp “CENSORED” means that this terrible Charlie Geren is…I guess censoring babies? Censoring information about babies? Censoring pro-life messages? That’s it. He must be censoring pro-life messages about how it’s bad to kill babies. You flip to the back, and now the message is clearer. This has nothing (except tangentially) to do with abortion or reproductive rights. 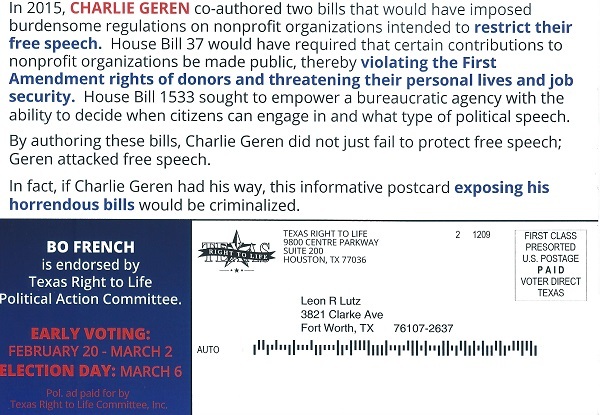 Apparently, Geren simply wanted to make contributions to non-profits public. Okay. I guess you could make the argument that such a stance is dicey. But it’s how they spin it on the back of the postcard that really makes me crazy. Mr. French says these “burdensome” regulations (because listing stuff is really hard) is “intended to restrict their free speech.” No. It’s not. There’s nothing (at least as far as I can tell from this postcard) about House Bill 1533 that restricts free speech. Putting aside the fact that money isn’t speech [deep breath] these donors can speak as many dollars as they want into the coffers of the Texas Right to Life Committee. The bill says that they then have to put their mouth where their money is and say who they are. Okay. I suppose there may be a crazy person out there who’s trawling through donor lists of the Texas Right to Life Committee so they can track them down and shoot them. (It’s certainly easy enough to get a gun in my neighborhood. There’s a gun show a thousand yards from my daughter’s bedroom every weekend. Why am I living in this state? I digress.) But, still, I think the likelihood of donation to a cause leading to loss of life is vanishingly small. Does anyone here think that Mr. French is opposed to this law? Does anyone think that Mr. French would prefer that Texas not be an “employment-at-will” state? [crickets] Thought so. But the thing about this that really gets my goat (and which is a basic thing I hadn’t really put together) is that people tend to conflate “freedom of speech” with “freedom of speech without negative consequences”. Guess what, dillhole, actions have consequences. My daughter (the one living less than grenade-launcher distance from a weekly gun show) understands that. And she’s younger than some of my shoes. If you walk up to your boss and tell him he’s a bald SOB who should be dead, he might just fire you. And you have no recourse. Your freedom of speech was preserved. As was your freedom to be a dillhole. Look, if you’re a donor to the Texas Right to Life Committee, or a supporter of Bo French, you should be proud of it. Don’t hide your light under a bushel! Let it shine for all to see. I don’t care. I’m actually mostly a pro-lifer. But I am emphatically an anti-illogicer. And this is some quality illogic that Mr. French is trying to use to get my neighborhood to vote for him. Hopefully the profusion of Charlie Geren signs I see around me indicates that it’s an uphill battle. First, a little context, if you’re reading this weeks or months (or years?) from now. Today is November 14, 2015, one day after a series of terrorist attacks in Paris. I have nothing to say about the attacks themselves. Horrible things happened. Nothing I say will change that, or likely reduce the pain of those affected directly. So, I’m not going to bother. What I am going to talk about is an article I saw very soon after the attacks. It was about Rob Lowe. Apparently, he tweeted some snarky comments about how French President Hollande was handling the situation. But that’s not what the article was about. It was about the Twitterverse having a collective conniption fit about Lowe, how the actor had been stupid and insensitive. So, I suppose I could talk about the cult of celebrity that we have now that makes anything a B-list (C-list?) star say worthy of analysis. Which is pretty dumb. Or I could talk about the state of journalism, that this cultish (anti-cultish?) response was, itself, considered by someone, somewhere, newsworthy. Also dumb. The angry tweeters response to Lowe is, hands down, the most laughably ironic thing I’ve seen in quite a while. Bear with me. I have a point. First, let me posit something that is only implied in the angry tweeters commentary: they are implying that Rob Lowe is on the side of ISIS. For him to dare disagree with the leader of the country attacked by ISIS? He must be on the side of the terrorists, right? How dare he! This isn’t said directly that I know of, but that’s the only way that the emotional reaction makes any sense. Hollande’s country was attacked by ISIS. Hollande was attacked by Rob Lowe. Therefore, Rob Lowe equals ISIS! QED. This reeks of insanity, but that’s how I read it. And I’m not done. One big difference between Western Society and ISISville, perhaps the defining difference, is tolerance. In the West, if you vocally disagree with those in power…nothing happens. If you vocally disagree with those in power in ISISville…you are beaten and/or jailed and/or maimed and/or killed. And what did Rob Lowe do? He disagreed with someone in power. (I couldn’t tell you if he was right or wrong. I don’t know. And that is irrelevant to my point.) And nothing has or will happen to him. Which is only right and proper in a society ruled by the idea of freedom of expression. But the angry tweeters, who have attacked Rob Lowe as a mouthpiece for terror…are reacting the way ISIS does! They have heard something they disagree with, and they respond with hate and invective. It’s an astonishing case of lack of self-reflection. But here’s the silver lining. This is why Western Culture is so resilient. Even when part of the society acts kind of like ISIS, they really don’t. They shouted their anger at Rob Lowe; they didn’t throw rocks at him. They called him dumb; they didn’t storm his house and string him up. The very free speech that they are so annoyed by when it comes from this actor, is the same free speech they enjoy when hating him. The ironies abound, but for me, there is at least hope for the future. Though not for the future of journalism. Sheesh, people! 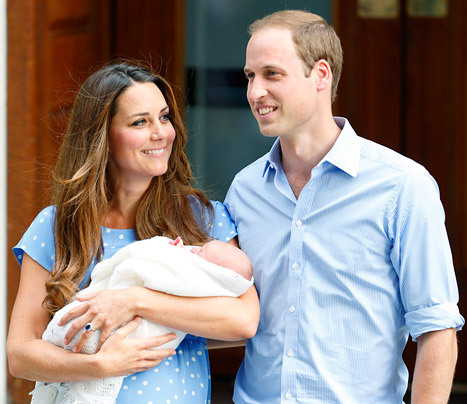 So, there are people talking about Kate’s baby-bump, and telling her how to get rid of it. Then there are people talking about those people, telling them that they shouldn’t be shaming her like that. Then there are people talking about those people, telling them that by calling attention to the first batch of people, they’re really still shaming her by telling her “It’s okay to look that way,” as if it wasn’t already. Then there’s the reporter telling me about all of those people. Talk about a meta-waste of time. 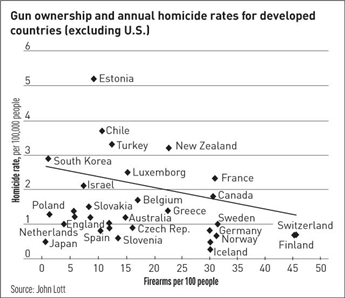 This graph, which conveniently does not include the United States (which would pull the trend line closer to level) and which does not take into consideration different cultures, different population sizes, or any countries you would call war torn, posits that more guns equals fewer murders. (Not to mention it assumes something as complex as the interaction of gun ownership on human activity must be a linear relationship.) I don’t buy it, but then, there’s nothing really to buy. Yes, with this sample, there is a trend. I could cherry pick my own countries and generate a line in the other direction. This, however, doesn’t advance the debate. Wow. It doesn’t get any flatter than that. 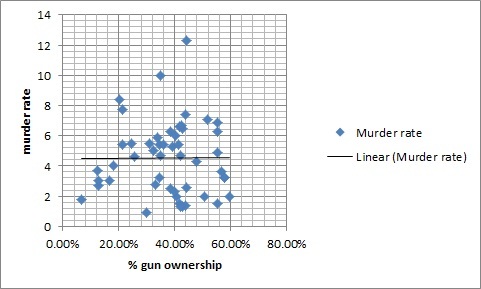 This indicates there is essentially ZERO correlation between gun ownership and murder. Good to know. But wait. Something doesn’t feel right about this analysis either. There is something substantively different between Alaska and Connecticut. That’s population density. 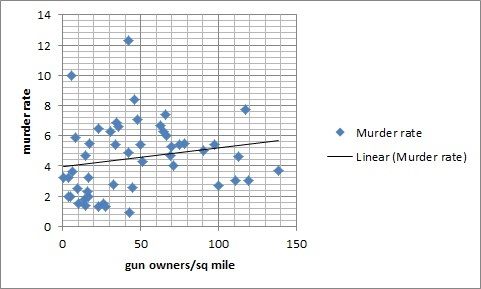 I wonder if there’s any correlation between the density of gun owners and murder rate? In other words, does simple proximity between gun owners increase the likelihood of murder? Awesome! Point proven. 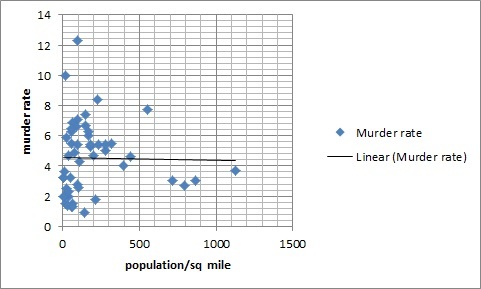 More guns in a smaller area increases the murder rate. What do you know. Slight trend downward. So, close proximity to humans is slightly less conducive to murder… unless there are guns involved.